I really stayed up late one night reading this and didn't want to leave the author's words, so I read all the way through the afterword as well. Josephine has a brilliant mind and her imagination helps her create a program that lets users keep track of their memories using social networking, photos and even thoughts. Judith was the center of attention growing up while Josephine was always a bit strange but now that Judith has drifted from job to job, her sister hires her to help out at the new company, Genizah. The story weaves back and forth between the sisters and Solomon Schechter's tale of his life and ultimate discovery of a vast collection of Jewish historical artifacts in Egypt. Also, explain is the life of Maimonides, the author of A Guide for the Perplexed, and one of Schecter's main discoveries. There are several other minor historical characters scattered about as well. The story really tells about the bond between sisters and brothers mixed with a thrilling contemporary of intrigue. As Josie travels to Egypt to help the new library at Alexandria catalog, she leaves her young daughter, Tali at home with her business-partner husband, Itamar. After helping to organize the library's catalog, she is kidnapped and thought to be murdered by a militant faction. The outcome is anything that you could expect. Told through multiple points of view, there is nothing that can prepare you for the ending. One of my favorite things to do is guess how a plot will turn out and I was completely off guard with this one. 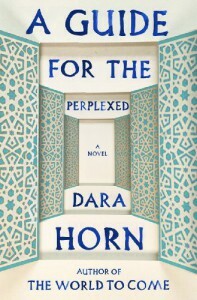 I love historical fiction, especially when it is related to current events and Horn does an amazing job with bringing these tales together. The underlying themes of redemption and how blood is thicker than water are played out as each set of characters try to do the right thing for their families. One interesting note is the role Asthma plays in each set of characters and their stories. Maimodes, a physician in ancient Egypt, tries to help a ruler treat his condition and sends his brother to his death seeking herbs that will help control it. Schecter suffers from the condition as well and Josie also suffers from it. The details and patterns that link each of these characters is amazing. I haven't read anything this thought provoking in a long time. I really didn't want this book to end and found myself looking a lot of things about the historical characters since I found myself fascinated by them. This would make a perfect choice for a book club since there are so many different ideas that can spark discussions about technology, current world events and family. I really enjoyed this one and I am going back to find more by this author.